Pharmaceutical Validation & Qualification Introduction. Bio-Med and Pharmaceutical Validation & Qualification is more than just raising an IQ and OQ. It requires an understanding of the the overall quality requirements as detailed in 21 CFR Part's 820, 211, 210 and 11. The process starts at the procurement stage with the VP, and continues through the URS - DQ - VRA - IQ - OQ - PQ and is achieved with the completion of the process qualification (PQ). The equipment must then be controlled throughout its working life by Change Control, which is there to guarantee that its validated status is maintained and never compromised. Incorporation of any updates or modifications requires a thorough understanding of both the business processes being supported and the associated regulations - GMP . What is Validation or Qualificatiohn? Bio-Med and Pharmaceutical Validation or qualification can be very simple and straight forward, and then again at times, it can be complex and difficult. A great deal depends on the contents of the company Corporate Quality Manual. This is where all company approved bio-med and pharmaceutical validation and qualification regulatory Practices and Procedures must be defined and documented. Failing this being in place, the VMP and VP must document the validation procedures that the company has decided are required. The protocol writers and executors must then follow these instructions. It can; at times, be almost impossible to split such systems into computers and or equipment; therefore the system must be considered, taking note of the specifics of each and the overall functionality achieved by the system. While recognizing that the diversity of software, as defined in GAMP 4 & 5 is vast, you have to remember that the typical operating systems (windows or similar) because of the vast number in service, are taken as standard, and do not require to be qualified. Therefore when you come to application programs; that run on these standard operating systems (STS), your system qualification effort does not have to include the STS; just the application program itself. Review supplier & validate functionality and any bespoke code. Audit supplier, validate system functionality and review code IAW full life cycle requirements. Systems Specifically written for Owner. Audit supplier, validate all code IAW full life-cycle requirements. The EU GMP Annex 11 on Bio-Med and Pharmaceutical Validation & qualification of equipment, requires that there should be "adequate alternative arrangements for systems that need to be operated in the event of a breakdown". These arrangements should provide for alternative workaround procedures to be implemented and followed, to replace the absent system functionality and allow safe continuation of business during the failure. Regulators, and internal / external auditors, require evidence that Business Continuity Plans have been created and rehearsed, including records that the alternative processes have been suitably documented and personnel adequately trained. Companies should be able to demonstrate that they can ensure that critical services and processes can continue, that the restoration of workforce, facilities and equipment occurs in a timely fashion and that there is a timely resumption of essential business functions. In pharmaceutical validation and qualification regulators require documents to be based on agreed and approved policies and procedures. 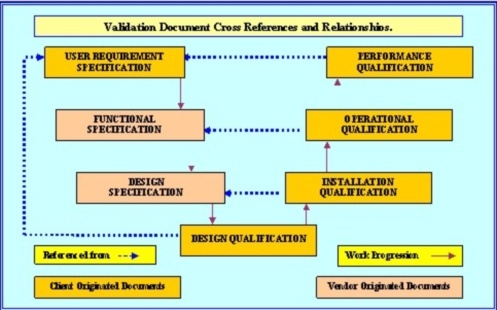 That means you can't start writing an Installation Qualification (IQ), without having an approved (VP) in place to scope the IQ activities, and of course the VP can’t be started Pharmaceutical Validation Plan unless there is an approved User Requirements Specification (URS), in place to define the requirement that are to be qualified and validated. The VP, or in major or new systems, VMP, should be the document that starts the bio-med or pharmaceutical validation or qualification process. The VP/VMP must give management's reason for requiring the validation task, along with documenting the justification and scope. It must further delegate responsibilities for all the qualification activities, and set the scope of these actions. At this stage a Risk Assessment (VRA) should be used to set this scope. Once these high level decisions are made, the VP must be signed off as a working document that has now set the company’s validation and qualification requirements for this piece of equipment. Once proposals to satisfy the URS have been received, they are required to be qualified by the execution of a Design Qualification (DQ), which must confirm that the design proposal, if proceeded with, will satisfy the requirements as detailed in the URS. Personally, I cannot over emphasize the importance of the DQ. I have seen some horrendous blunders perpetuated by some really clever dedicated individuals, just about all of these blunders would have been caught at DQ level, if there had been one. Protocol authors can now write the IQ – OQ – P1Q – P2Q documents, in accordance with the company’s approved practices and procedures. Whether Performance Qualification P1Q and Process Qualification P2Q are both required depends on your VP. A machine can have a range of settings and functions, perhaps you only want to validate one process – perhaps you want to validate the entire functionality - perhaps your product is too expensive to waste and you intend to use a placebo to validate the actual process settings. There are many consultants that would argue; that you must start at User Requirements Specification level (URS), since your P2Q is based on verifying that the URS has been satisfied. This is where the justification for your approach must be documented in the VP, without the end user documenting what the equipment is required to do (the exact measurable process and specifications), how can you scope a P2Q? When a P2Q that is carried out using equipment that has not been the subjected to the above procedures, (or a very near justified equivalent), it has no standing and all product subsequently produces would be considered by the regulators, as adulterated. CAPA remains the single most cited subject in the Bio-Med and Pharmaceutical qualification industries, with 50% of FDA warning letters being concerned with CAPA problems. Why does this not surprise me? Because having worked in the industry for many years I I have worked with many companies who paid scant regard to the subject. Yes, there are companies around who do the job properly, but according to statistics, half don’t. I think most persons who have worked in the industry for any length of time, have seen the occasion when production output has taken priority over the proper investigation of customer problems and or complaints. The catch-22 is always cost, is it more cost effective to have a compliant CAPA system, that is not only keeping you compliant with regulatory requirements, but also producing data that enables you to reduce customer complaints and quality deviations; or is it more cost effective to pay lip service to CAPA requirements on the bases that you don’t have many customer complaints. Our most popular purchase still remains the Package 3. 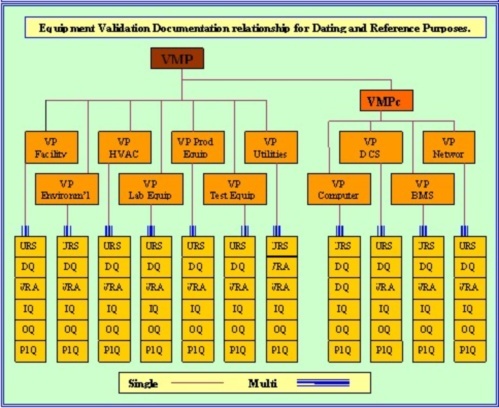 This contains all the protocols and associated procedure documents required to carryout a validation task. Our most common technical inquiry is still the question asking; Does a validated piece of equipment, that is moved from one area to another, require to be revalidated, even if the move is only across a room.